Welcome to the new Civic Museum of Regina! It’s Regina Re-membered, Re-visited, and Re-ported. From the early days to the present, come and discover our city’s Re-markable history. 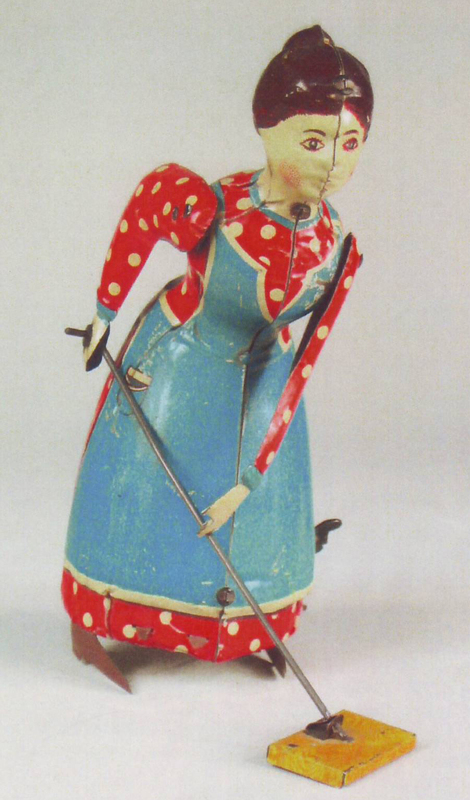 The 1920’s German Fisher Tin Busy Lizzie Housemaid was manufactured by Georg Fisher who had started production of tinplate toys in Nuremberg, Germany in 1903. One of its most appealing products was Busy Lizzie Housemaid. This toy, donated by Mel Hodder in 1983, is still in full working order: once wound up, she moves forward energetically pushing her mop, still complete with sponge. Tinplate was used in the manufacture of toys beginning in the mid-19th century. Made from thin sheets of metal plated with tin, hence the name tinplate, the toys were originally assembled and painted by hand.